Miriam Van hee is a poet and a Slavist scholar. Her poetry has been translated into ten languages and has been awarded the Jan Campert Prize, the Dirk Martens Prize and the Herman De Coninck Prize, among other literary prizes. Her poems are also featured in the literary game ‘Puzzling Poetry’ by Studio Louter and poet Lucas Hirsch. The app was launched during the Frankfurter Buchmesse 2016, where Flanders and the Netherlands were Guest of Honour. 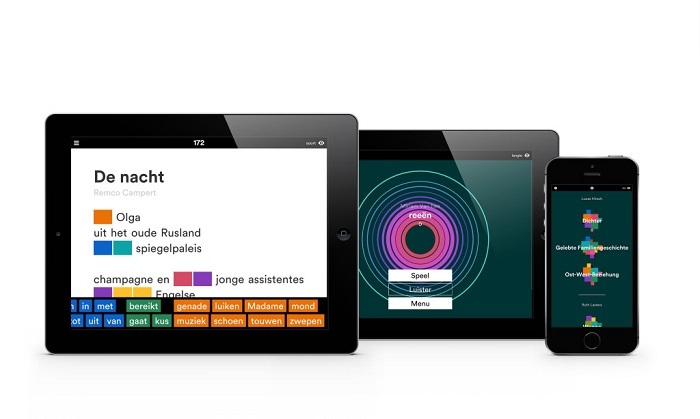 The trilingual game (in English, Dutch and German) was created with support from the Dutch Foundation for Literature and the Creative Industries Fund NL. Free downloads are available for both iOs and Android. In Puzzling Poetry, every word in a poem becomes the piece of a puzzle. Players read the entire poem by solving the puzzle. They are helped by the design, which assigns a colour and shape to every lexical class: verbs, nouns, short or long words. Together, they form patterns that give insight into the structure of a poem and the poet’s writing style. Playing around with the words leads to a new, immersive way of reading poetry. An overview of translations of poetry by Miriam Van hee can be found in the Translations database. More information on this author may be found at Flanders Literature.